"Optimized Ares version for less resource consumption." Why pay for something when you can get it for free? It's simple logic right? P2P programs have been around for a while, they connect you with the software black market where you can share and collect files from other users for free. Ares Lite is the lightweight version of its sister application Ares. 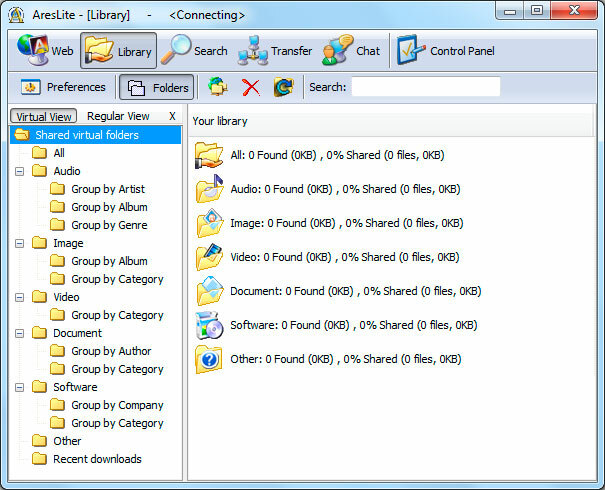 Both applications allow you to search the P2P network for files to download. They allow you to download anything available on the network from applications, to music, to movies. One of the great things about P2P networks is that the downloading speed is extremely fast. While some of this can be attributed to your internet connection, most of it is due in part to seeders. 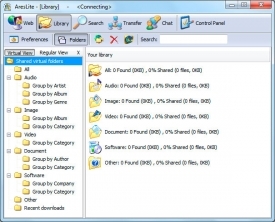 A seeder is someone who downloads a file and re-uploads the file to the network. In order to seed, a constant internet connection is needed. Many people cancel the seeding process because the bandwidth allocation can be precious at times. The more seeders you have for a file, the faster it will download. This is because each seeder has a piece of the file and they are accessed simultaneously when you select a file to download. Instead of downloading a file packet by packet from one source, you are downloading them all at the same time from several sources, thus speeding up your download. Ares and Ares Lite both utilize this system so that their users have access to fast downloads all of the time. The main difference between Ares and Ares Lite is that unlike Ares, Lite does not have all of the advertising that eats up your bandwidth during downloads. It is also very lightweight so that it can run on older operating systems such as Windows 98 and later. The application consumes less memory and computer processes than its sister application.